When you open or close the vehicle with the SmartKey, the fuel filler flap is automatically unlocked or locked. arrow next to the filling pump indicates the side of the vehicle. The fuel filler flap is located to the rear on the right. ► Switch off the engine. When the engine is running and the fuel filler flap is open, the yellow reserve fuel warning lamp and the = (USA only) or 2 (Canada only) Check Engine warning lamp may light up. Further information about warning and indicator lamps in the instrument cluster can be found in the Digital Operator's Manual. ► Press the fuel filler flap in the direction of arrow 1. The fuel filler flap opens slightly. ► Turn the fuel filler cap counterclockwise and remove it. ► Insert the fuel filler cap into the holder bracket on the inside of filler flap 4. ► Completely insert the filler neck of the fuel pump nozzle into the tank and refuel. ► Replace the fuel filler cap and turn it clockwise. The fuel filler cap audibly engages. ► Close the fuel filler flap. Close the fuel filler flap before locking the vehicle. 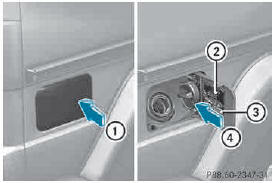 A locking pin otherwise prevents the fuel filler flap from closing after the vehicle has been locked.